I hadn’t been to Killington in a decade and some things hadn’t changed. Yea the access road was deserted and there was only one lift running, but the mountain still somehow seemed huge to me. Some things had changed. I’ve done some skiing in the last ten years and I was ready to take on Killington’s expert terrain. Superstar, the storied trail was looking good from a distance and even better up close. I met Riverc0il at the base of the quad at 9:30. Superstar’s bumps were a bit of a gut check for me, skiing after a six-week layoff. My first ever May ski day was perfect. A relaxed crowd was enjoying beautiful blue skies, warm temperatures and big bumps. There was ten feet of snow on Superstar. Skyelark was softer with “mellower” bumps and we did most of our laps there. I did maybe six or eight runs in the morning and was ready for a break at noon. The incredible value the mountain offered — a $36 dollar lift ticket — looked like a solid business decision. While there was never a lift line all day, most of the quads going up the mountain were loaded and the umbrella bar was doing a steady business. We took a long relaxed lunch hoping to get a few more runs in the afternoon, and maybe a beer. We ran into ml242 and VT-Freeheel and hung out on the deck. Around 2pm we headed off to find some flatter snow that was being ignored. To many skiers the phrase The Beast, is shorthand for Killington, the big, accessible, challenging mountain that is managed to provide the longest lift served season in the east. Killington is the well-suited to playing the role of The Beast. 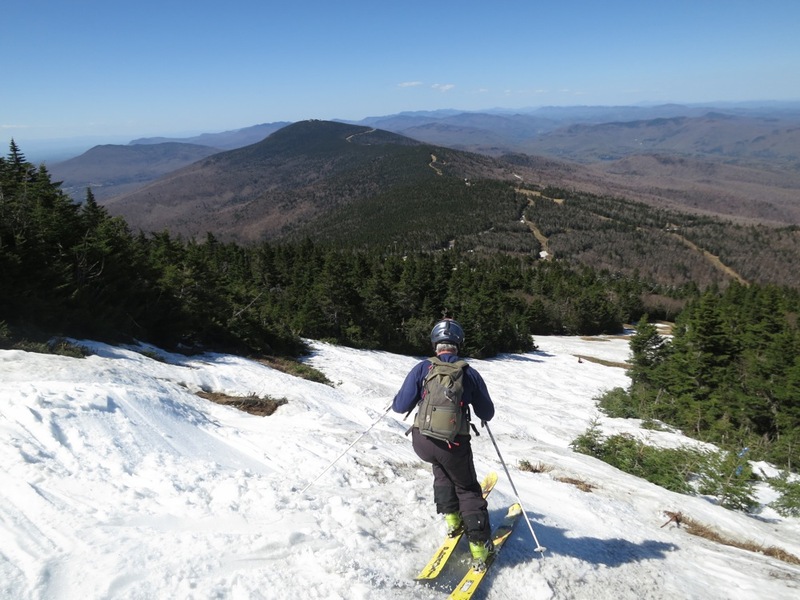 Located in Central Vermont, with good access to major markets, the mountain has the terrain, elevation and orographic “magic snow” to be the beast. That said, there’s nothing, NOTHING, that dictates that the ownership at Killington has to do it. It would be Powdr Corp’s prerogative to run a standard November to April season. And for a time, they did. But it seems that Killington is embracing the beast within again. 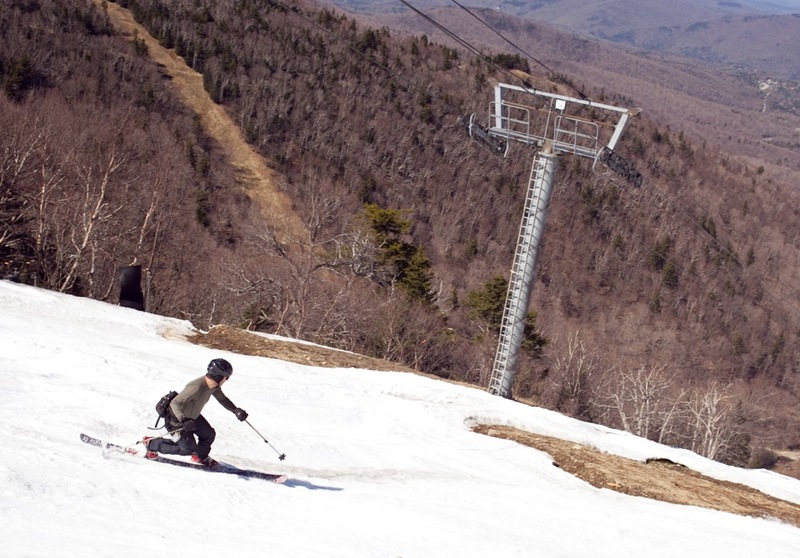 Killington is a huge asset for eastern skiers. By pushing for the earliest possible opening, stockpiling snow for May and doing everything in a big way, Killington elevates our sport. Been around the Northeast over a decade and totally ignored and missed out on the late Spring opportunity at Killington. But this year as the post-season withdrawal symptoms kicked in after WF and Gore Mtn closed I decided to check out the place (4/28, 5/1) and had the same impressions. I’m now also positively intrigued to visit Killington during Winter when the entire mountain is in full operation. I haven’t skied Killington in many years, but thanks for inspiring some memories. 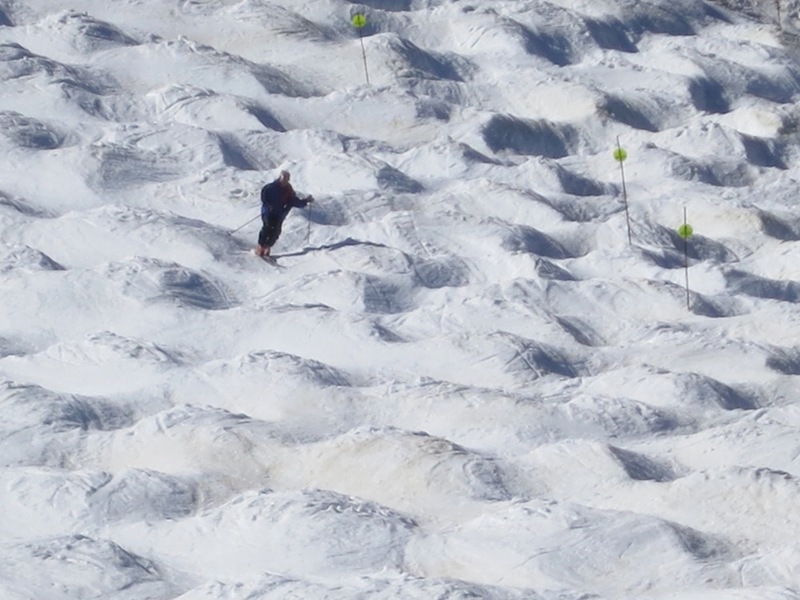 When I was very little we skied nearby Round Top and had season passes. Once a year we would head over to Killington for the free skiing between 8:00 and 8:30. We would take the gondola to the top, which –for us kids — was like a trip to Switzerland. As I started to ski Killington more, I remember looking up to Superstar, which had no snow making and was rarely open. It seemed fantastically steep from the bottom of the Killington chair. And Big Dipper and was a narrow, tree run filled with rocks and roots. The whole basin, in fact, was not open very often and thus acquired a mythic quality. Similar, in some ways, to the Baldy Chutes at Alta. I also remember when Bear Mountain first opened. (I think I participated in the second annual Bear Mountain Mogul challenge.) There were just two runs on it, Outer Limits and the Wildfire Giant Slalom Trail. My story is almost the same as yours. I first skied Killington about ten years ago on a Warren Miller voucher. I hadn’t been back till last year. I skied there twice last Spring. I was also there Sunday. I think I may return one more time before I hang up the skis for the season. 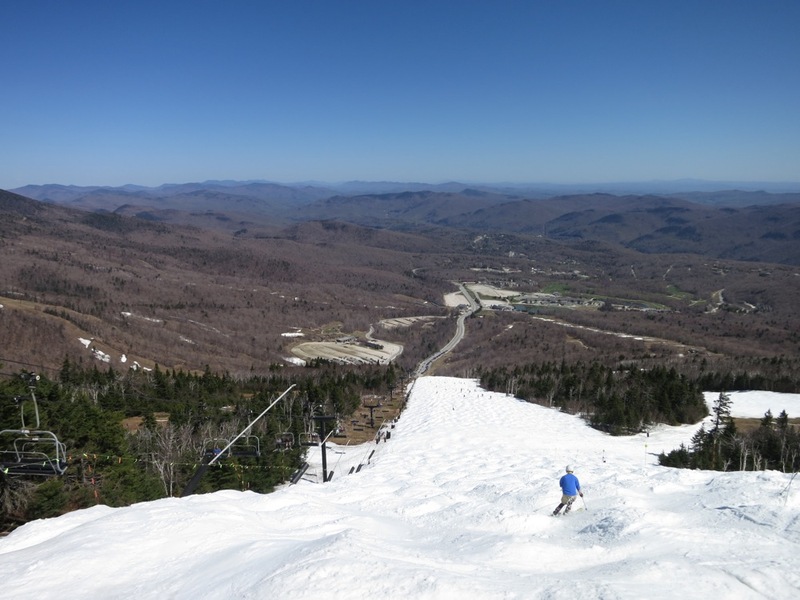 Kudos to Killington for attempting to push the season into June. The usual response to the statement that I intend to ski over the weekend this time of year is, “Water skiing?”. Gotta love it! Nice. My ski season ended a bit early this year, this should keep me stoked till November. I used to work at the Big K and they have stockpiling snow to stay open down to a fine art. Makes me feel bad for not driving over and partaking myself. That Killington listened to its skier base and re-instituted the policy of staying open later and opening earlier than other ski area is great,and is paying off. That Killington brought back the Bear Mountain Mogul Challenge and re allowed the party atmosphere that always let it be great is even better. The stockpiling of all the snow on Superstar and other runs and the preplanning to stay open barring unforeseen bad weather also means Killington is here to stay and be one of the if not the best ski area in the east. The entire town wreaks of being a great ski area with good night life, and many restaurants and Ive been to many. Actually the only problem I have with Killington is the price gouging of the base area food and the really expensive prices of drinks and cover charges at the majority of its nightclubs, but hey, you cant have everything. To me it’s all about the snow and the conditions and the attitude of the ski area management that listens to its skier base. 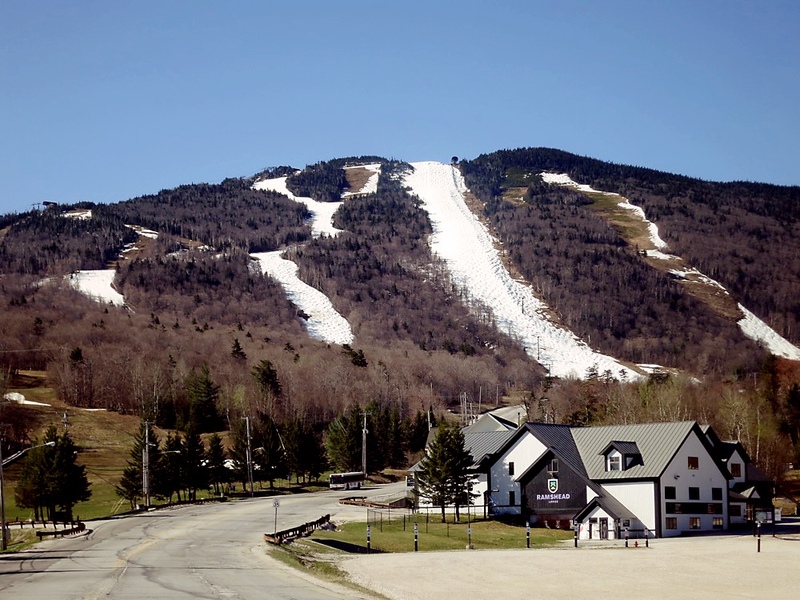 As a result Killington is drawing alot of skiers from other mountains to ski the longer season, and once they are there know they have to come back for more during prime season. Now Killington can lay claim to that Beast advertizing and really mean it. Keep going! I miss it. We use to ski Killington every May 1 and June 1 for the fun day slalom. You got a free lift ticket for entering and completing the race. Way to get at it! 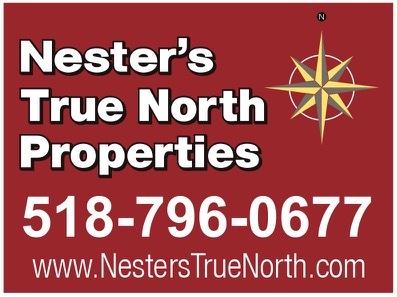 Thanks for providing us with all the info and fun this season. You are now one of my new ski heroes! Keep on turning. The thing I felt stood out was the people. May turns were chiefly had by folks with a passion for skiing. From experts to weekend warriors, seemed everyone were brothers in arms. Stopping to let the acid flow out of burning thighs/hamstrings, everyone had a smile and friendly comment. Also a nice feelings knowing everyone on the hill could turn and stop where and when they wanted……no fear of getting hit. Took off my helmet for the first time in 10 years. Bikinis on Saturday made the 16 hr turnaround commute worthwhile. Killington IS awesome but, it’s like New York City. While it represents some of the best in the business it also represents some of the worse and new comers need to know that while for the most part they can get some of the best in the east that quality is not across the board. Just for example, those who are new to the resort should be careful of where they shop. In my opinion there is a very wide disparity of quality in this area. I for one, always go to Aspen East where they have always been fair and respectful, however, when I went to a place called the Fore something or other, I was treated with no respect at all and when I asked 3 people the price of an item I was given 3 different prices. Like I said, variance and something to look out for, just like New York City .